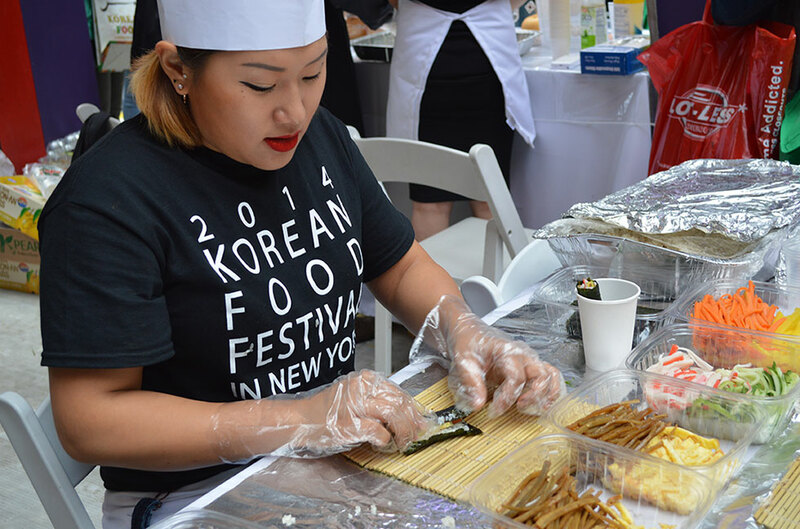 The second annual Korean Food Festival, hosted by the Korea Argo Trade Center, was held on October 17th and 18 in Times Square. The festival offered a huge range of Korean traditional foods, packaged products and drinks. The festival also included several stage performances, face painting and activities like a gimbap rolling tutorial. Having very limited knowledge of Korean foods, traditional and newer products, I ventured up to the infamous, touristy Times Square to check out the festival. This Times Square outing was one of the more pleasant experiences, mainly because free, international food was involved. 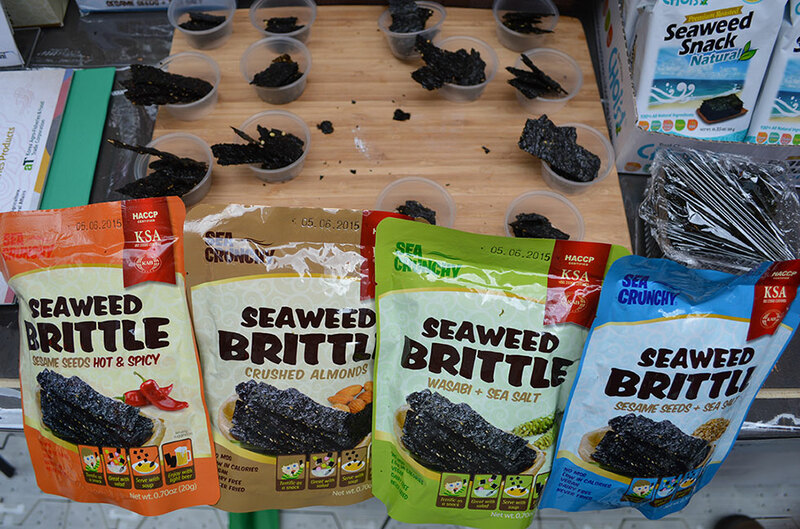 One of the samples offered was flavored seaweed brittle – a light, crunchy snack that has grown in popularity because it is rich in nutrients. It’s great for a light snack and can can also be wrapped in rice (like sushi) for a more filling option. Another Japanese inspired treat growing in popularity is rice balls, which are very similar to mochi. They are made from rice and bean paste and have that same doughy texture. 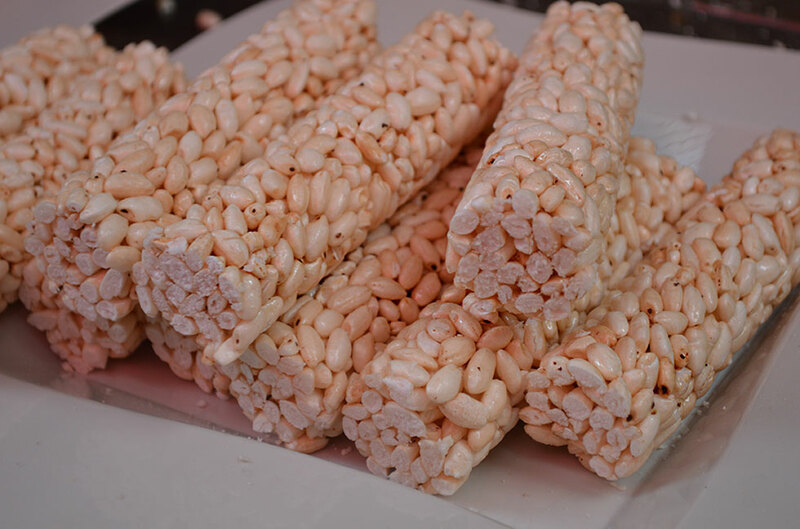 The rice sticks were similar to American packaged rice cakes. However, this Korean version was crunchier and much less flakey. A bite sized delicacy of persimmon, an orange fruit most commonly from Asia, and brie complemented each other perfectly for a flavorful punch. To show off its versatility, other vendors offered wines made from the fruit. The semi-dried persimmon in this bite was delicious, so I can only imagine how sweet persimmon wine would be (Wine Wednesday, anybody?). For more traditional, spicy Korean foods, I tried a cup of pasta with Korean chili sauce. The Korean chili sauce tasted great with the pasta, but it was very spicy and required a trip to the Organic Aloe water stand. Also offered were tiny samples of kimchi, a mixture of seasoned fermented vegetables – typically cabbage, scallions, radishes, or cucumbers – that is used to add flavor and spice to dishes. Last, and by far the hottest, was the ginseng chicken stew. 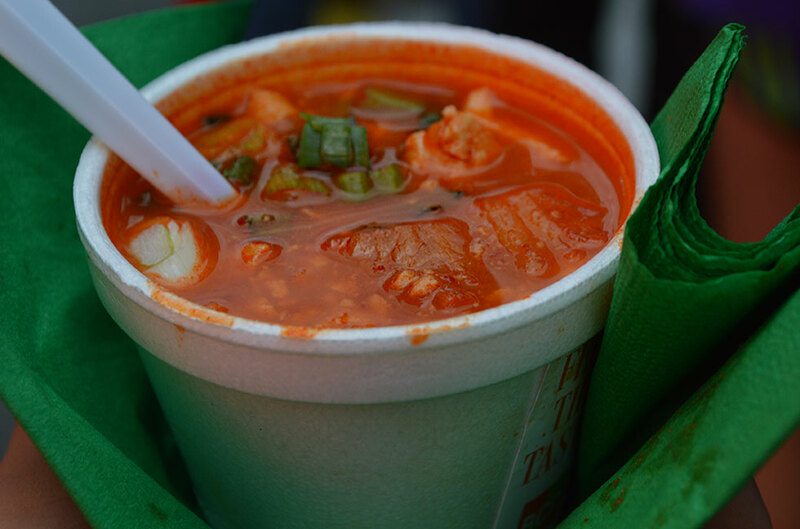 Despite the spice, it was warm and filling – perfect for the windy streets of Times Square in the late afternoon. The festival offered a great opportunity to check out the latest in Korean foods and packaged products. All of the volunteers and chefs were very open, friendly and enthusiastic about what the Korean culture and cuisine have to offer. Needless to say, taking advantage of food festivals in New York City to try new foods is a perfect way to spend a Saturday afternoon.